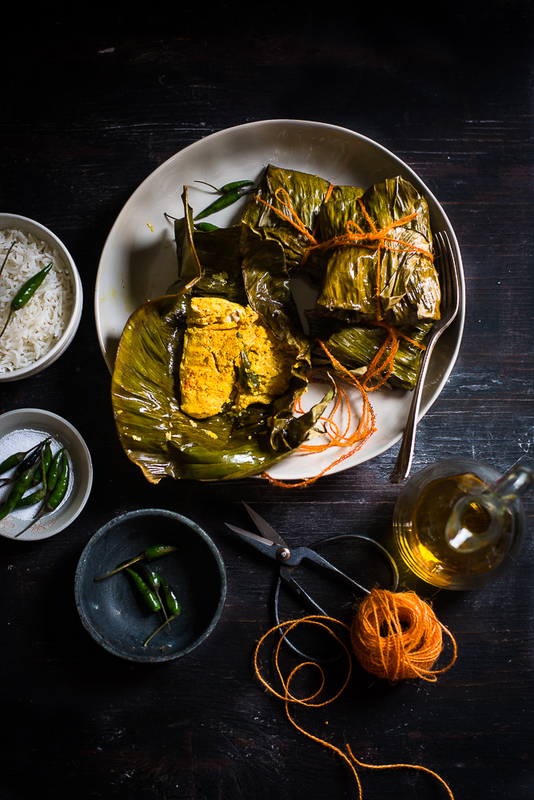 Macher Paturi is one of the favorite fish preparations to any Bengali. Unfortunately, it’s neither commonly available in restaurants nor made at home regularly. So you won’t get many chances to enjoy this dish. For me, the most memorable one is to have Ilish macher Paturi on the menu of my wedding day. 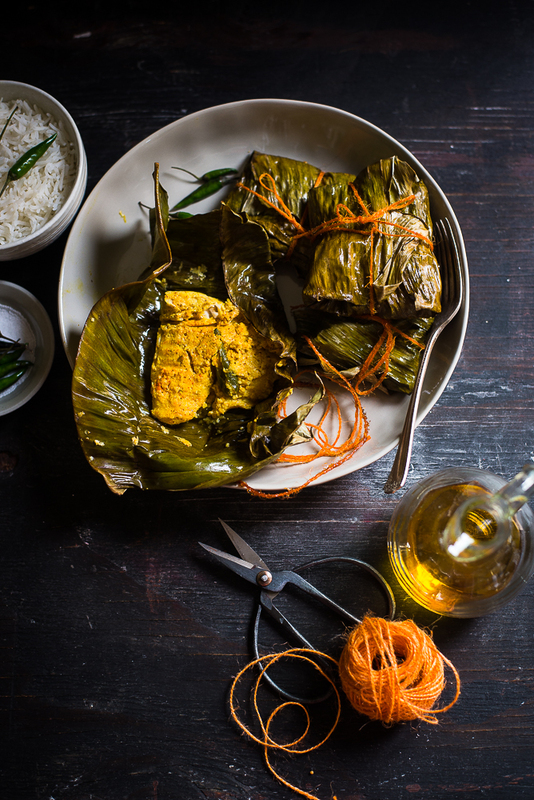 Things might have changed in Bengal now, lots of high-end restaurants have come up with all traditional Bengali food. Some of them may be offering Paturi on their menu. The word Paturi came from the Bengali word 'Pata' that means leaves. 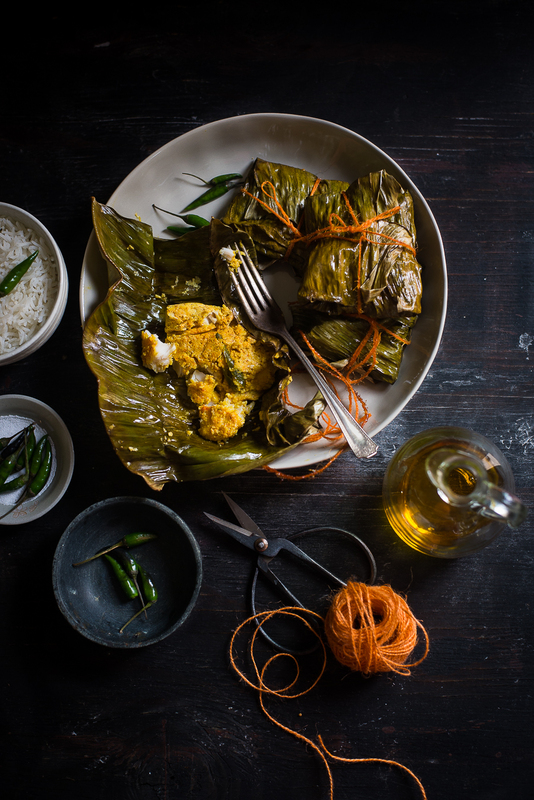 Macher Paturi / Fish Paturi is a preparation where marinated fish is wrapped in banana leaves and then cooked with low flame. For last few days, I was so craving for Paturi and so was looking for banana leaves. But here in the USA, finding tender banana leaves is not easy. Though a couple of Indian/Asian stores keep it, but most of the time the leaves are not fresh. Sometimes I get those banana leaves spending several dollars but had to throw them in the trash because of their poor quality. Last week I got some fresh tender banana leaves from one my friend's backyard garden. In Bengal, generally Hilsha, Bhetki and Chingri (shrimp) are used to cook Paturi. Here I use Swai fillet because the taste of this fish is very close to Bhetki. 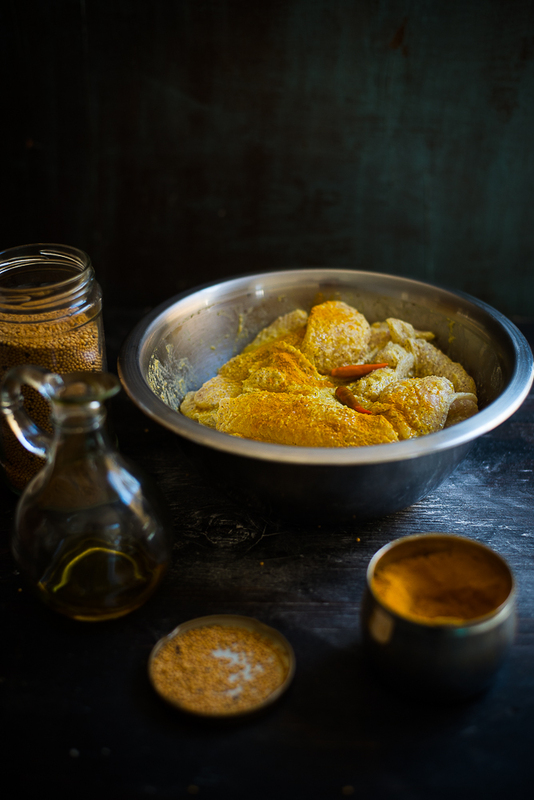 The fish chunks are first marinated in mustard, coconut paste and drizzled with mustard oil. 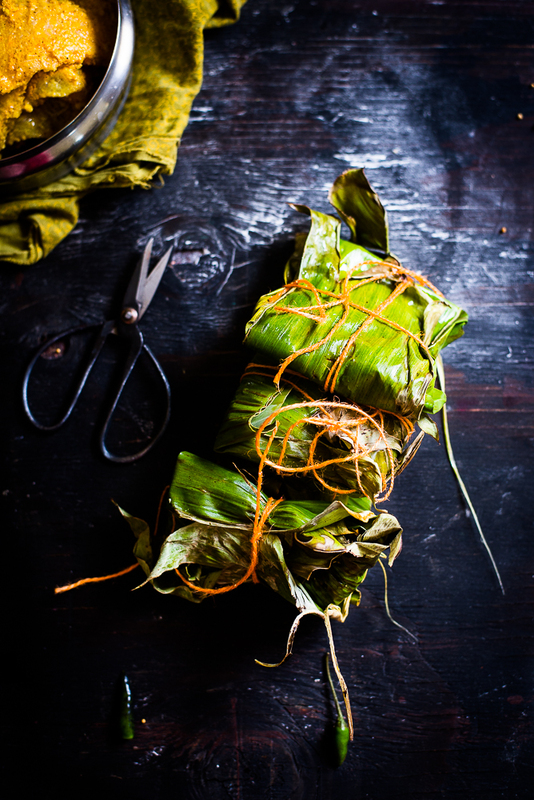 Then it is wrapped like a parcel in banana leaves and later the fish parcels are cooked in slow flame. Though Paturi is made with fish, but you can try the same recipe with Chicken, that I had posted a couple years back. Even vegetarian people can try the same recipe with vegetables and paneer. Mustard paste: half cup, you can use mustard powder paste too. kitchen twine/cotton thread: as required or you can use toothpicks also. 1. Wash the fish pieces and gently pat it dry with paper towels. Add lemon juice and salt to the fish and rub it. Leave it for 15 minutes. 2. If you are using mustard seeds make a thick paste with 2 green chilies. Or if you are using mustard powder make it a thick paste following package direction. 3. Make the grated coconut paste ready. Take a bowl, add mustard - green chilies paste, coconut paste, turmeric powder. Whisk it together. 4. Now add the paste to the marinated fish pieces. Rub it well. Add the mustard oil and mix it nicely. Keep the marinated fish into the refrigerator and let it rest for 4 to 5 hours. 5. Take out the fish from refrigerator. Heat a pan.Take one banana leaf, brush a little oil on the glossy side. Put it on the pan and slightly roast the leaf. The leaf will become soft and it will help the leaf from cracking. 6. Place a marinated fish piece in the middle of the leaf, add one teaspoon of marinade and half of a slit green chili on the top. Wrap the banana leaves from all sides and make a parcel as you are seeing in the above picture. Tie it properly with the thread. Toothpicks also work to tie it. Follow the same process for the rest of fish pieces. Let it sit for about 15 minutes. 7. Now add few drops of mustard oil to the pan and heat it up. Place the fish parcels and cover the pan with the lid. 8. Cook it on medium heat for about 10 minutes each side. Serve hot Fish Paturi with hot steamed rice. Discard the banana leaves and enjoy Paturi. You can cook Paturi in the oven too. If you want to do it in the oven. Preheat the oven to 350 degrees F. Place the fish parcels on a baking sheet and bake it for 25 to 30 minutes or until it is cooked.